Hi I am Alexander, CXO of digidiced and passionate boardgamer (and designer). Yesterday I finally got the chance to play a first round of Tail Feathers from Plaid Hat games (the awesome guys who brought you Dead of Winter as well). I bought my signed copy directly from Jerry Hawthorne at the Essen fair. The game is a two player dogfighting game. Mice and rat heroes battle it out in the trees and airspace on different trained birds. If you do not know Mice & Mystics: It is a story driven cooperative game about a kingdom where everybody gets turned into some kind of critter (mice being the good guys) and fighting it out in a still normal sized world. 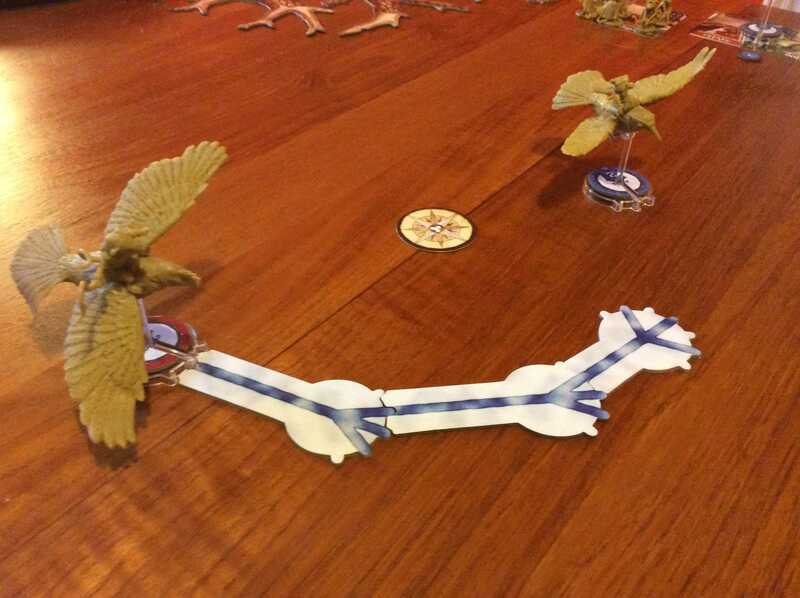 In Tail Feathers each player chooses one side and either handpicks all the forces, agrees on a battlefield and special rules – or uses one of the 4 premade scenarios. Sadly the story falls short in this game – at least if you expect something voluminous as in the original one. The game material is in a quality we came to expect from the brand with a lot of cool miniatures (5 birds, 5 riders, 6 commando mice and 6 commando rats as well and 1 additional rat heroine), some big tree templates, action cards, scenario cards and unit cards and more of the M&M dice. 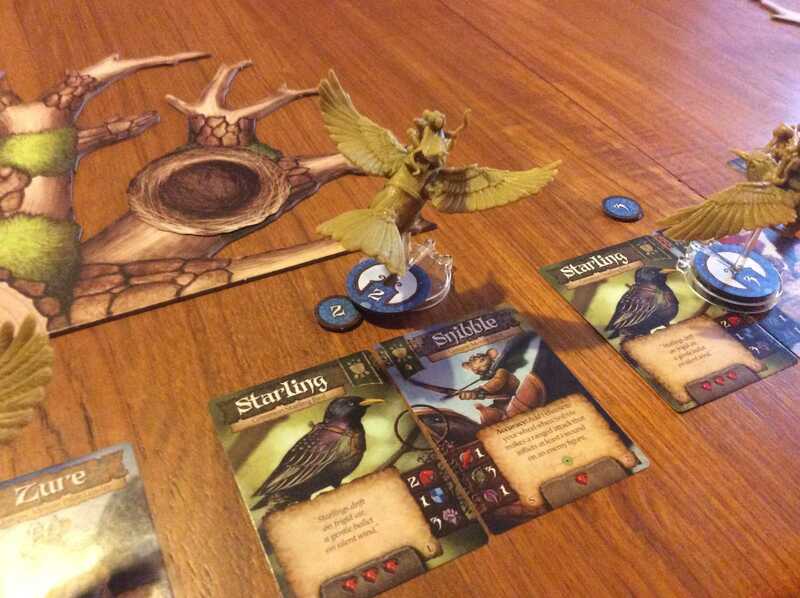 The miniatures are really awesome, especially the birds which are rested on a clutch and can be turned to indicate the direction you want to fly. You can even combine the base game M&M with TF! We played the first scenario with basic rules. The objective being: Destroy the other party’s nest. So we got our heroes and villains out of the package and prepared our forces for battle. The setup was done in about 15 minutes. Then we were ready for take off. First you choose a secret mission (Decoy, Intercept, Siege, Patrol, Rescue or Special) and simultaneously deploy a mission card somewhere on the battlefield. 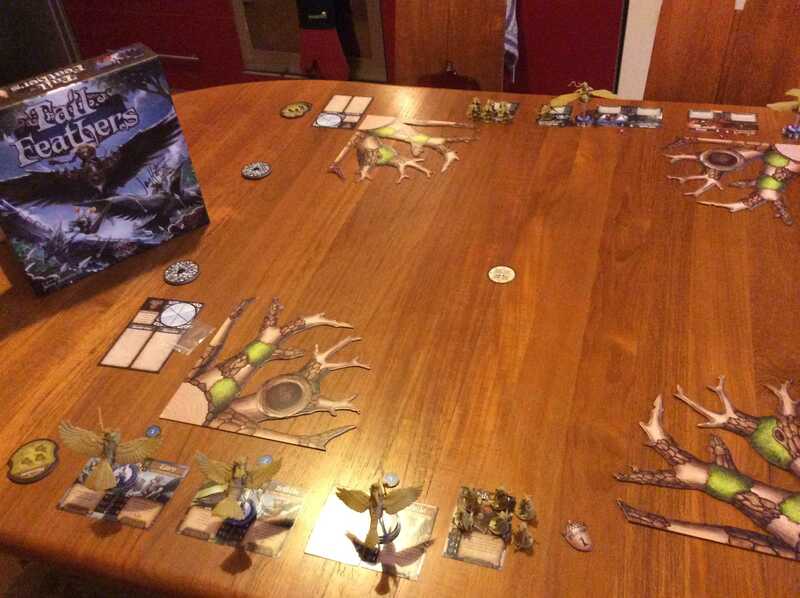 Then each player chooses up to 4 miniatures to fulfill that mission. Now both players roll for initiative. 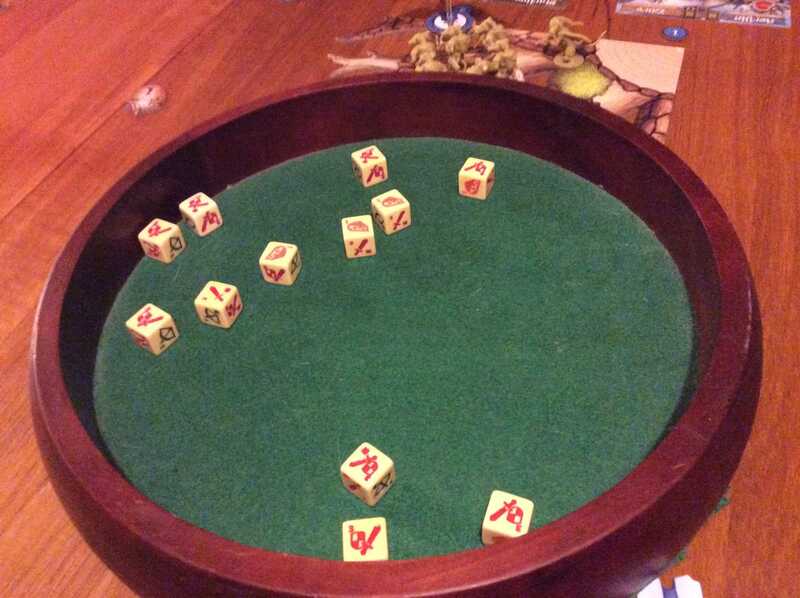 A player may spend cheese tokens to add additional dice. After that you may tilt your birds one step to the left or right to show in which direction you want to fly. This can be changed at a later time by a piloting check (rolling some dice). Beginning with the highest initiative player, you take turns activating your forces (either a single hero or a squad). 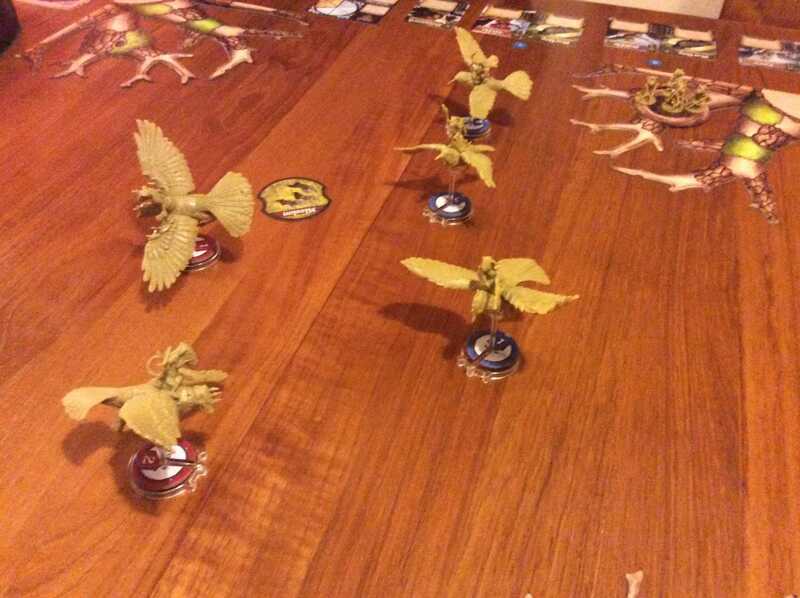 When you activate a bird unit you must move it using 2 or more flight templates. You have to say beforehand what length they should have (like “short, short, long”). You then take the according pieces and lay out your flight path. 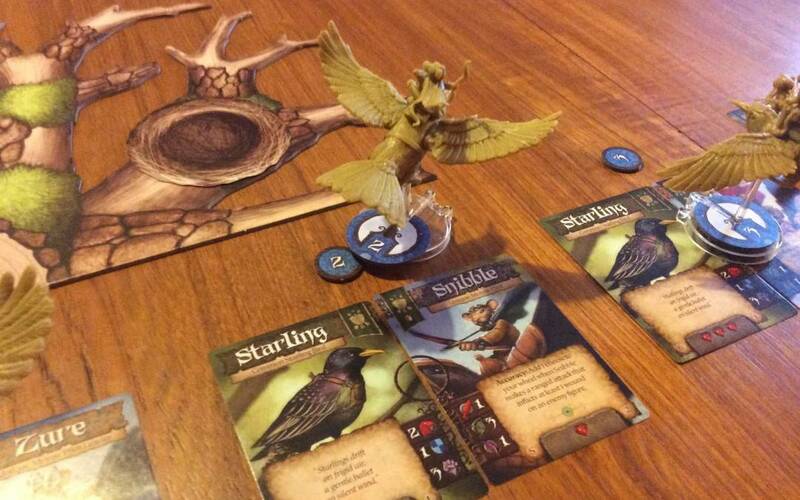 After flying and moving you may attack with a miniature that is in range (determined by a cool plastic stick). In the final phase, after everyone has activated all troops, the secret missions are revealed. The mice moved first and brought their three birds closer to the rats’ nest. The rats started a counter attack but missed the opportunity to severly damage the mice. The battle in the air raged on, while the secret missions tried to lure the opponent into traps or away from their original flight paths. The mice guards made a fatal and game changing error and the swooping down of the mighty bird ended the life of half of them. 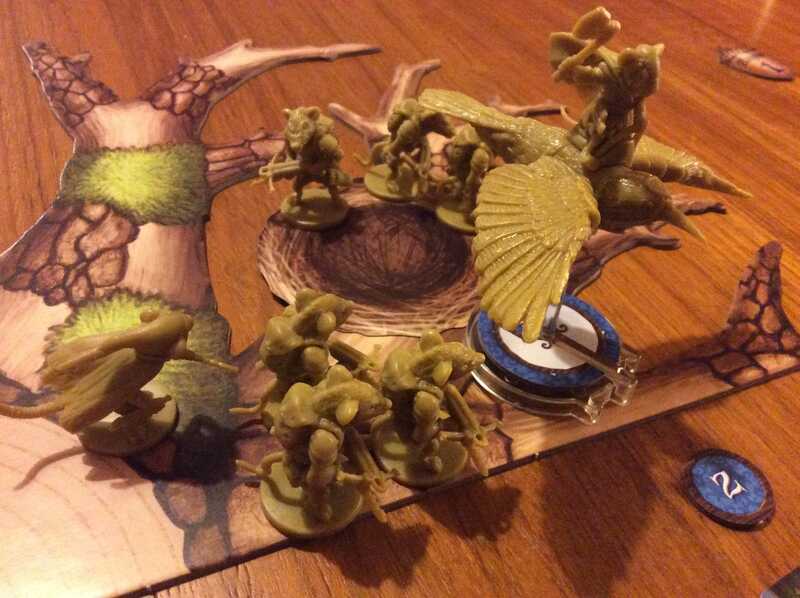 Shortly after, the first rat hero and its bird were destroyed by a death spiral attack from one of the mice lancers. The victorious mouse pilot unfortunately came to close to the rats’ home nest and took severe damage from crossbowfire. But the rats, losing one of their best, had to stall for time to finally come though with their siege mission. The enemy’s tree was quickly climbed while the remaining mice where too far away to do something about it. The rat commandos lead by a rat assassin stormed the nest and hacked it to pieces after the brave mouse guards fell in a futile attempt to fight the much stronger invaders. The battle was over after mere 6 rounds. I liked it. Is is a light take on the dogfight genre and aimed at a younger audience or fans of the M&M brand. While my opponent hated the luck dependency I will try it again with more than the basic rules, including action cards and scenario specials. Enjoy your next game night!